Since having run in the last Gainesville elections, Mark has been increasing his knowledge of local governments and has been remaining very active in citizenship activities. 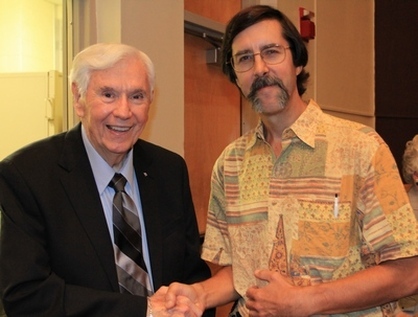 In April of 2012, Mark graduated from the Gainesville Citizens' Academy. That biannual training seminar gives citizens an overview of all of the departments of the City Of Gainesville. Participants attend six, weekly, four-hour sessions in which department heads and their staffs acquaint participants with the responsibilities and workings of their departments through classroom presentations and tours. With several current and past Gainesville elected leaders and many current and past unelected leaders being graduates of the Gainesville Citizens' Academy, it is a recognized training program for current and future elected and unelected civic leaders. For additional photo images of Mark participating in the Citizens' Academy, click here. An image of Mark's certificate is here. Participants dress in bunker gear (protective fire fighting gear) while executing a vehicle-crash-trapped "victim" (imaginary) extrication; while ascending a training tower with a charged (heavy with highly pressurized water) fire hose to deliver water; while performing a blind building search for unconscious occupants (dummies) and while assisting in the treatment of an ailing "patient" (dummy). Mark and his fellow squat members successfully struck all imaginary fires and safely rescued and treated all imaginary victims. 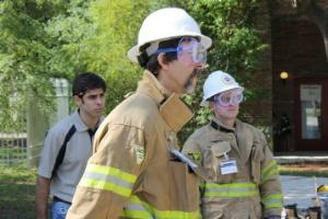 For additional photo images of Mark participating in the Citizens' Fire Academy, click here. An image of Mark's certificate is here. On February 13, 2013, Mark attended a Public Officials Workshop that the Alachua County League Of Cities sponsored. (The "Workshop" was more of a seminar than a workshop. Attendees listened to a presenter and did not engage in work themselves.) The workshop was open to local government elected and unelected officials and to current candidates for public offices. Marilyn Crotty, Director of the Florida Institute Of Government at the University Of Central Florida, presented the workshop. The workshop covered municipal charters, open government laws and ethics. It occurred at the City Hall of the City Of Alachua. About fifty public officials and candidates from throughout Alachua County attended the highly informative workshop. 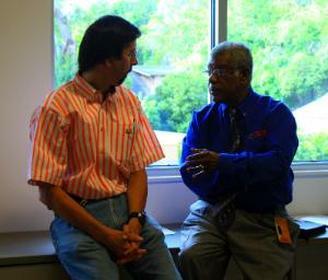 In August 2012, Mark actively participated in one of the four, repeated (identical), annual Community Conversations workshops of the County Of Alachua that occurred throughout Gainesville. (Actually, he attended parts of two, consecutive workshops to participate in all the activities of the workshops since he arrived late to the first one.) These workshops allow citizens to voice their ideas and priorities and to develop a hypothetical budget for the county. 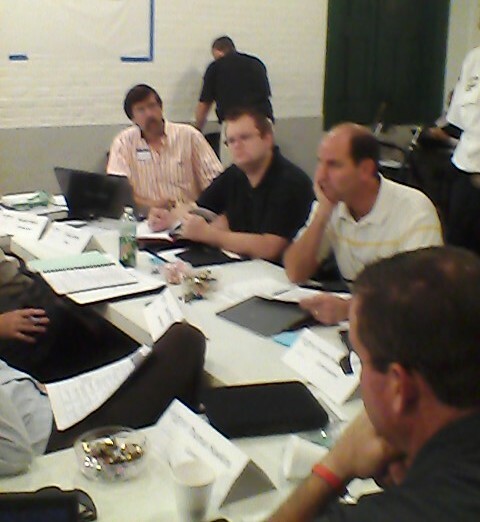 In August 2012, Mark participated in the annual City-wide Strategic Planning Retreat of the City Of Gainesville. This intensive, all-day, annual workshop gives city commissioners, various department heads and citizens a chance to review and redefine the strategic plan for the city, the list of governing objectives for the city that guides policy making and operations for the following year. Mark learned much about the direction of the city and contributed ideas and language for the objectives. For a photo image of Mark participating in a small group during the retreat, click here. Regularly since the election, Mark has attended Gainesville City Commission and Alachua County Commission meetings, workshops and meetings and has often communicated his sentiments, concerns, ideas, thanks and congratulations to commissioners and staff members through e-mail. Since the election, Mark has attended two meetings of the Gainesville Energy Advisory Committee (GEAC), an unpaid citizen advisory board of the City Of Gainesville on February 2, 2012 and on. On September 19, 2012, Mark attended a special meeting of the board of directors of the Rate Utility Commission, or RUC, of Gainesville Regional Utilities. Managers and staff reported on the progress of the civil City Of Gainesville and GRU in meeting self-assumed targets in reductions of climate-changing emissions. Despite many implemented reduction measures, the City and GRU were eleven percent above the end-of-2011 target. Mark has attended five public lectures staged by the Graham Center For Public Service at the University Of Florida. On February 13, 2012, he attended a lecture by Amira Hass, an Israeli journalist who lives in occupied Palestine. Her lecture was entitled, "Israel and Palestine - Fear Of the Future." On March 20, 2012, he attended a lecture by Steve Bousquet, Political Reporter for a consortium of three major, Florida newspapers. His lecture was entitled, "Florida State Legislature 2012 Session Review." On April 3, 2012, Mark attended a joint lecture by Bob Graham, former Democrat United States senator and former governor of Florida, and Lee Constantine, former Republican Florida state senator, co-founders of the bipartisan coalition of conservation organizations and conservationists, the Florida Conservation Coalition. Their lecture was entitled, "Florida Conservation Coalition." On September 12, 2012, he attended a lecture by Jonathan Haidt, Professor of Professional Leadership at New York University and author of the book, The Righteous Mind--Why Good People Are Divided By Politics and Religion. His lecture was entitled, "Civility In American Politics: How To Get (Some Of) It Back." Professor Haidt asserted that morality is the basis of civilization, that morality proceeds from tribalism and that morality typically blinds people. He appeals for moral and intellectual humility and shared experiences as precursors to collaboration and negotiation. You can view a video of Professor Haidt's outstanding lecture here. On October 9, 2012 Mark attended the lecture of David Frum entitled "Why the American Political System Doesn't Work." David Frum has been a political commentor for many years on network and cable television programs, has authored a number of books, has been a blogger and served as an advisor in the George W. Bush administration. You can view the lecture here. On October 12, 2012, Mark attended the forum, "Florida's Future: A Conversation With Florida Governors." The Florida Law Review sponsored and staged the event at the Phillips Center For the Performing Arts in the Cultural Plaza on the University Of Florida campus. Former governors Reuben Askew, Bob Graham, Bob Martinez, Buddy MacKay and Charlie Crist offered the wisdom of five, long, distinguished public service careers when they answered questions that the moderator and audience members posed. They urged that audience members prepare for public service by getting a good education, by engaging in civic involvement at any level and by never becoming cynical. You can read newspaper articles about the event here and here. On March 30, 2012, Mark attended a lecture by Latoya Hunter, a graduate student from south Florida. Her lecture was entitled, "Informal Economic Participation As an Element Of Bonding and Social Capital--Miami As an Example." The lecture was part of the Black Lecture Series of the Institute Of Black Culture of the University Of Florida. Ms. Hunter described the informal economy of greater Miami and how it shows the development of individual and social capital. She asserted that to transition from an informal economy to a public economy further empowers individuals and their community. He attended one meeting of the private-sector organization, Alachua Clean Energy (ACE) that is working to devise and promote means to finance energy efficiency and renewable energy projects. On April 21, 2012, he attended the first Solar Energy and Efficiency Expo on the University Of Florida campus that ACE and the Clean Energy Logistics Lab (CELL) of the University staged. On June 23, 2012, Mark attended the statewide rally to mobilize and marshal support for restoring and protecting the water resources of Florida, Speak Up For Silver Springs and Florida's Waters. The Florida Conservation Coalition organized the massive event that occurred at the Silver Springs River State Park and drew many renowned leaders in the conservation community. Mark has attended numerous meetings of Green Caffeine (formerly Green Tea) organized by the Green Building Council of North Central Florida and Green Drinks organized by Go Green Nation. On April 3, 2012, Mark toured the Innovation Hub, the University Of Florida center for developing and commercializing promising technologies. Mark has continued to compose and transmit to residents and business owners in his neighborhood, the Near South Neighborhood, and to citizens outside the Neighborhood who are interested in it occasional Near South Neighborhood e-mail dispatches that have presented important information and announcements. He has also continued to work with residents and business owners to reduce nuisances and crimes. 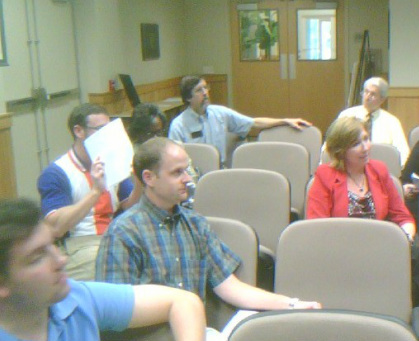 Mark listens to the presenter during the Public Officials' Workshop in Alachua.